“Razor sharp” brain power and a way to combat memory loss – these are the main promises of the supplement BrainPill, which boasts of sheer simplicity in its naming as well as well-outlined benefits with just one pill a day. Now, just what exactly can BrainPill potentially bring to the table? This nootropic supplement claims to enhance your focus whether it’s day or night; performance, whether you’re tired, jetlagged, or deprived of sleep; ability for complex problem solving, offering instant competitive edge; reading recall and pushing one’s mental limits; feelings of wakefulness and alertness; and generally just being at your best. According to the product copy, this pill serving as your “unfair advantage” boasts of a premium, consistent formulation, mostly via the Synapsa Natural Memory Support, which harps on the improvement of information processing, memory, and intellectual functioning in healthy adults. There’s also Cognizin, which is derived from the nutrient Citocoline known for increasing levels of certain neurotransmitters like dopamine, acetylcholine, and noradrenaline. BrainPill claims to be the stand that you take against mental fatigue and brain fog – boasting of a formulation that increases blood flow to the brain and delivers vital nutrients to keep the mind flexible, sharp, and getting things done more easily and quickly. The makers of BrainPill banner the brain supplement’s “100% natural active ingredients and scientifically tested formula. The positive effects of these components are deemed widely documented and working synergistically for massive mind and memory results. Also known as CPD-Choline, this water soluble compound found in every cell in the body has proven to be an exceptional brain nutrient. A patented, standardized extract of bacopa monnieri and has been studied in clinical trials and documented to noticeably improve cognitive function and mental performance. Derived from club moss and deemed protective of your brain function through blocking the breakdown of acetylcholine, a neurotransmitter enhancing alertness and playing a key role in memory. Derived from the periwinkle plant and used to enhance memory and cognition. Extracted from the ginkgo tree, this is seen to expand blood vessels, which may lead to enhanced circulation and allow for better delivery of oxygen and blood glucose to the brain. Considered important for healthy nerves and red blood cells, and may also help prevent the brain from shrinking with age. Derived from black pepper, this is used in nutritional supplements to specifically encourage synergistic action in ingredients. This aids in the production of neurotransmitters, chemicals allowing brain and nerve cells to communicate with each other. DHA boasts of special importance for brain cells, with long-chain omega-3s supporting the growth and development of the fetal brain and with benefits continuing all the way through to the end of life. Derived from lecithin and works to improve attention, concentration, mood and short-term memory as well as the performance of daily activities. An amino acid that powers up dopamine production to help improve focus. A major amino acid uniquely found in green tea and has been historically reported as a relaxing agent that stimulates brain waves, the same ones active in meditation. Crucial for proper brain function and plays an important role in mental and emotional health. The brain pill is believed to tap into the brain’s power to regenerate – given the right raw materials for it do so. In our own four-week trial of BrainPill, it became quite evident that personal energy levels went a notch higher. The clarity and memory improvement were noticeable, and there’s that desire to keep going and being at our best in everyday goings-on. Reports of adverse effects were practically nonexistent, although it could depend on one’s perspective: BrainPill can keep one going and raring to do things at peak levels most of the time. It could be gym time, work, or study hours but the reported benefits may manifest consistently. The dosing lose is a mere 1 capsule a day, which is a good estimation of how potent the formulation could be. That is a much appreciated aspect of this product, as it removes the need to take multiple pills a day to sustain the gains in energy, memory, and mental performance. 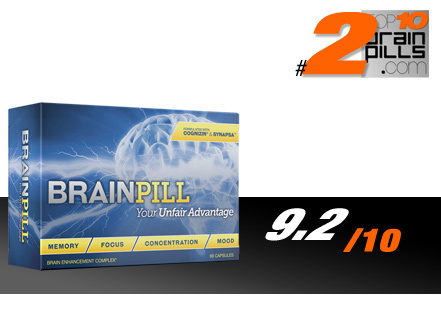 BrainPill enjoys plenty of customer testimonials and glowing reviews online, but then of course one has to proceed with caution if this is one’s foray in brain supplementation or if there is any potential medical issue to consider. All in all, reviews suggested greater mental clarity and memory benefits, although take note that that could be largely individual in nature and there are several factors at play in the improvement. There is much to be appreciated in a brain supplement like BrainPill (never mind the confusion that may stem from the generic-sounding name) that combines tried-and-tested ingredients in a single one-a-day formulation. The consistency in claims and what users see in real life is an exemplary one, which convinces us to rate this powerhouse as the second on this review list. Feeding one’s brain with nootropics and related supplements entails due diligence in research and seeking the highest quality, and we think BrainPill is up to task.